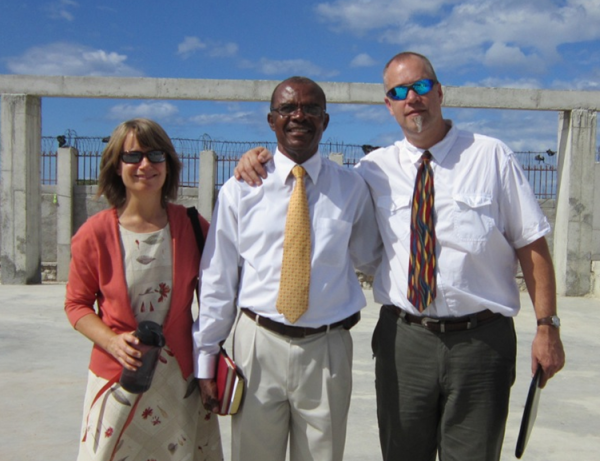 Haiti Outreach Ministries’ beginning can be traced back to a chance meeting between two students at Cincinnati Christian University in the mid-1980’s, Leon Dorleans from Haiti and Walker Gaulding from Virginia. A God-incidence between these two young men led to a friendship, which in turn led to another God-incidence that began the ministry you see today. After college, both of these graduates went their separate ways. 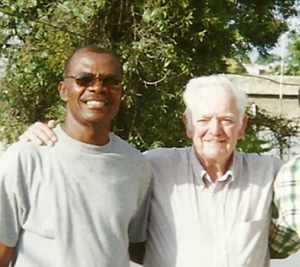 Walker returned to a church in Warsaw, Virginia, and Leon returned to Haiti where he started a church in Cité Soleil, the poorest community in the Western Hemisphere. The worshippers of this church were meeting in a narrow street under tarps, a street where raw sewage ran in a ditch directly alongside. Leon’s congregation numbered about 120 at this time, and they had been able to secure some land, but had no means to erect a building on the property. About the same time, Walker’s home church, Fairmount Christian Church in Mechanicsville, Virginia, contacted him to see if he had suggestions about potential mission trips. Walker immediately thought of Leon and had the church contact him. In August of 1989, the very first team went to Cité Soleil. Twenty-one members from Fairmount, along with Walker, built a crude “pole-barn” type structure with a tin roof that became the church building. Walker was honored to preach to these people who were hungry for the Word. During that week, the team from Fairmount witnessed firsthand the deplorable living conditions in Cité Soleil. The houses were mainly small tin and cardboard shacks with dirt floors and lacking inside plumbing and electricity. There were open sewers and over 85% unemployment. Access to medical care was virtually non-existent and most of the adults were illiterate with no money to educate their children. The lack of availability and affordability of food was a disturbing reality. The team members shed tears over what they saw. It was so far beyond their comprehension that people could be living like that in this century but they felt God was in this place. In the Haitian people, the team saw resiliency, as well as a love and trust in God. They were truly thankful for what they had. The team was deeply touched and quickly realized that there was so much more to do. Leon shared with the team his perspective on the impact the lack of education in his country has had over many decades. He shared his dream of wanting to start a school along with the church. In discussing the possibility, the idea of a sponsorship program was born, and Pat Smith, a team member, offered to find sponsors. On the plane ride home there was much prayer and discussion about the overwhelming needs they had seen among the Haitian people. The Fairmount team knew they had to do more than just get sponsors. God was moving them to do much more. Once back in the United States and with more prayer, David Armistead, a member of that first team, approached Leon about forming a 501(c)(3) non-profit corporation to help make any gifts to the Cité Soleil church tax deductible. This was the organizational foundation of Haiti Outreach Ministries (HOM) and the beginning of a great partnership. In 1990, HOM was incorporated with David Armistead as President. Pat Smith, Jo Ann Miles and Pastor Leon were HOM’s founding Board Members. David provided 16 years of volunteer service as HOM President through 2006 and is now President Emeritus. Bill Glass succeeded David as president and served through the challenging years after the earthquake until July 2013. Chris Northup assumed this role in mid-2013 and currently serves as Chair of the Board of Directors. In 2018, in response to the growth of the ministry and increased organizational complexity, HOM hired Gary Fulton as its first Executive Director. health care. Together, with God’s grace, HOM and MICECC strive to meet the spiritual and physical needs of the Haitian people. Since its humble beginnings in that Cité Soleil street, HOM and MICECC have grown to minister in four communities around Port-au-Prince: Cité Soleil, Terre Noire, Repatriote, and Baryè Fè. Although improvements in overall Haitian living have been minimal, we have been blessed to be the hands and feet of Christ for many in the Port-au-Prince area. We are immensely grateful for the countless volunteers over the years who have not only gone to Haiti but those here who have prayed, donated their time and money, and volunteered in so many ways. Pictured here are Walker Gaulding and his wife Mary Bob and Leon Dorleans. 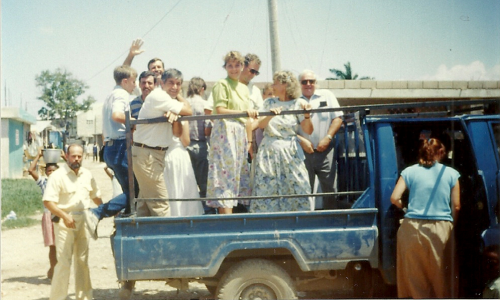 Walker and Leon remain good friends, and Walker and his family travel to Haiti frequently.